The assembling machine 3 is the third and final tier of assembly machines. Like the assembling machine 2, it can use liquids in crafting. An assembling machine 3 with max energy reduction (80%) needs less than half the energy of an assembling machine 1. 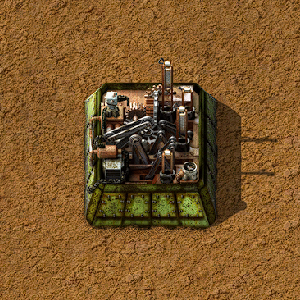 It is the only assembling machine capable of crafting faster than the player (crafting speed 1), without the use of modules. An assembler's maximum possible crafting speed is 11.25, using 12 beacons filled with level 3 speed modules. This uses 2.5MW on the assembler alone, and requires 8.3MW in total to run. Assembling machine 3 has up to 6 ingredient slots, so it can make any recipe in its category.